Updated for game version 1.50.67 (Feb. 21 patch). If you have issues with the Gallery, download this update. Updated for game version 1.49.65 (Feb. 5 patch). If you have issues with the Simology panel, download this update. Updated for game version 1.48.94 (Dec. 20 hotfix patch). If you have issues with time control shortcut keys not working in Tab mode, download this update. Updated for game version 1.48.90 (Dec. 18 patch). If you have issues with time control shortcut keys not working, download this update. Reworked the right click money cheat so that you can now also add/subtract a certain amount. Updated for game version 1.47.49 (Nov. 13 patch). Added a new career promotion/demotion cheat. Added a new Fame & Reputation cheat. Updated for game version 1.45.62 (July 31 patch). Fixed the issue that the career objective cheat only superficially completes the objectives (i.e. the game still thinks you didn't complete them even though the UI says you did). Fixed the issue that the money cheat doesn't work without testingcheats enabled. Fixed the issue that the money counter doesn't get updated if the money cheat was used in build mode. Added a new work/school performance cheat. Added a new career objective cheat. Updated for game version 1.33.38 (Aug. 22 patch). Added a new character value cheat. I plan to add more features to the mod and you can vote here for features you'd like to see. The mod now no longer requires testingcheats to be enabled to function. This means that the script must be installed, or the mod will not work. 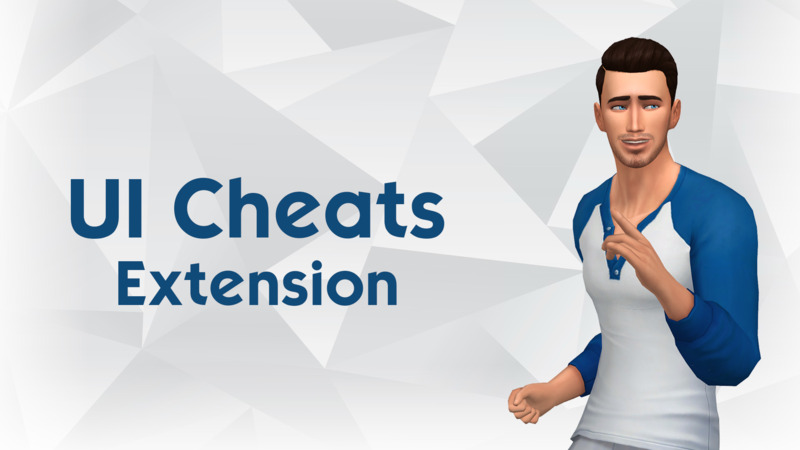 This mod enables the UI cheats extension, which allows you to use cheats by directly clicking on the UI, as opposed to typing a command. Right click on a needs bar to set value (from -100 to 100). Left click on the money counter to gain $1000. Right click on the money counter to set household funds. Right click on a Sim in the relationship panel to set friendship/romance values (from -100 to 100). Right click on a moodlet to remove the moodlet. Right click on an aspiration goal to fulfill it immediately. Right click on a skill bar to set level (from 1 to 10). Right click on the in-game clock on the UI to set time (from 0 to 23; for instance, entering "15" will set time to 3PM). Right click on a promotion task or a work from home assignment to complete it immediately (note that it currently does not work for daily tasks). Right click on a work/school performance bar to set value (from -100 to 100). Right click on a job icon in the career panel to promote or demote your Sim. Right click on the Fame or Reputation meter in the Simology panel to set rank (from 0 to 5 for Fame and 0 to 7 for Reputation). To install, extract the zip file and place both the .package file and the .ts4script file in your mods folder. Script mods need to be enabled in the options menu for it to work. Note that script mods can only be placed at most one subfolder level deep. Make sure only one copy of the script and one copy of the package file are installed. If you have older versions of this mod, delete them first. If cheat windows do pop up but nothing happens after entering a value, this means you installed the package file correctly but not the script file. If the left click money cheat is the only thing that works, this also means that the script file is not installed correctly. This mod overrides the following resources and will conflict with other mods that also modify these resources. The script module only adds new custom commands to the game and it does not conflict with other script mods. 3. Place both the .package file and the .ts4script file in your mods folder. For a full guide to downloading complete with pictures and more information, see: Game Help: Downloading for Fracking Idiots. XCAS core mod: more tattoo locations, edit naked outfit, slider hack, body hair, more - update 5/23/16 Steam version added.